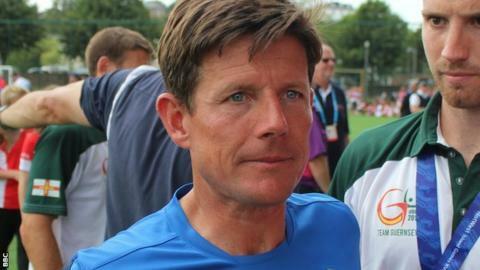 Guernsey manager Steve Sharman has left his role as manager of the island team after four years in charge. He joined the coaching staff in 2011 as assistant to previous boss Kevin Graham, who he succeeded in 2013. Sharman helped Guernsey win the Island Games title in 2015 and won two of his four Murattis against arch-rivals Jersey, including this year's final. "There's always a time that you have to realise that life cycle of being in this role comes to an end," he said. "It's just the right time - I think, previously, when I was asked if I would take over maybe there weren't too many people who were in a position to do it. "I think now the island is blessed with exciting, young, talented individuals who can lead the next group of players to some success." Guernsey were knocked out of this summer's Island Games tournament at the semi-final stage, while Sharman's job had been in doubt last year after a second successive Muratti defeat. He will continue to coach in the island and plans to complete his Uefa A Licence coaching badges in July. "It'll allow me to continue to coach at Guernsey FC, to coach in the Guernsey academy and hopefully help the next generation of young players," Sharman added.